- A line from Adama implies that he is at least 100 yahrens old. - This episode establishes that many but not all ships in the fleet (including vipers) are capable of light speed or perhaps faster. - Boxey: "Come on, Muffet, they're going to argue." Serina: "We're not going to argue." Boxey to Muffet: "Yes they are." Apollo: "Yes we are." - Starbuck: "Remember, these controls are as sensitive as a schoolgirl's... uh... lips." Here's an improvement. We're shown some material tackling relevant issues facing the RTF. The fleet must travel at the speed of its slowest member; vipers are used to scout about and do patrol. 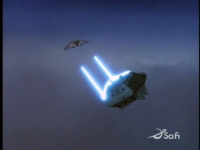 It is also implied that the colonials and the Cylons have the ability to travel at at least light speed which complicates the issue of the fleet's escape if they're unable to make full use of their speed potential. 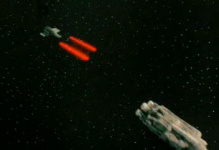 Baltar is on their tails and has a plan to take out the fleet. Surprisingly, his plan seems competent enough; though you've got to wonder just what the hell he does all day in that throne room. It would have been far less cheesy to just depict him overseeing operational details on the bridge or control room or whatever of the Cylon Basestar. It's only the 4th episode, and it's already a cliche to always depict the Imperious Leader or Baltar as having to plot and scheme in an evil imperial throne room. Another annoying detail: this episode is highly sexist. All viper pilots are men? All women are shuttle pilots at best? Beyond sexism, there's unprofessionalism. It is becoming evident that the Galactica is decidedly nonmilitary in its operations. But despite all this I still enjoyed the episode quite a bit. It wasn't filler and a waste of time like the latter half of Saga was. The cliffhanger wasn't too exciting though. 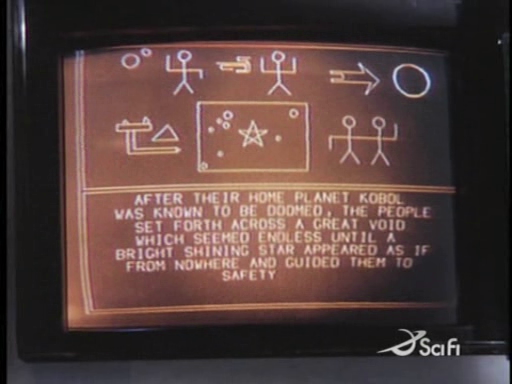 It's pretty clear that beyond that "magnetic void" will lie the planet Kobol. But that's a small deficiency. - According to Adama, there were many cities on Kobol, Eden was the largest. - Lucifer and the Imperious Leader appears to be a newer, more advanced versions of the Cylons, more advanced than the Centurions. - Adama lunging at Baltar. Kobol was interesting, but I'm not sure what we got out of this. Baltar's scheming was the most alluring aspect to the episode; spending all this time on Kobol and getting nothing out of it seemed somewhat frustrating. 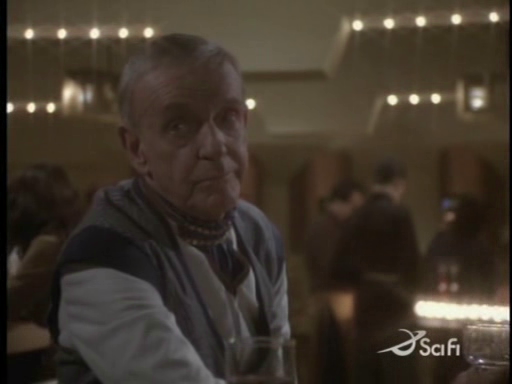 Adama discovers something he thinks is profound only to have the Cylons destroy it before he can make any sense of it. I'm not sure whether I'm glad to see Serena go or not. She was one of the better characters, but with the show's blatant sexism, I'm not sure I'd have enjoyed seeing her stick around further just so we could see her character abused further. In the end, the episode seemed like another excuse to have a dogfight, but if they wanted to fill time doing dogfights, at the very least they could stop recycling material. That, and Baltar's motives and decisions never seemed quite "logical" as Lucifer would put it. All this cheesy innuendo gets in the way of the Cylons + Baltar accomplishing anything. And while it's nice to see the bad guy lose, it's frustrating to see them depicted as totally incompetent. I've watched the series up to this point now, and several things strike me. In many ways, BSG is the anti-Trek. The feel of the remaining humans taking on the Cylon Empire is more like the feel of mid-century WWII movies or the coming Reagan 80s than the utopioan ideals of Trek, which is philosophicaly rooted in the more progressive 60s. 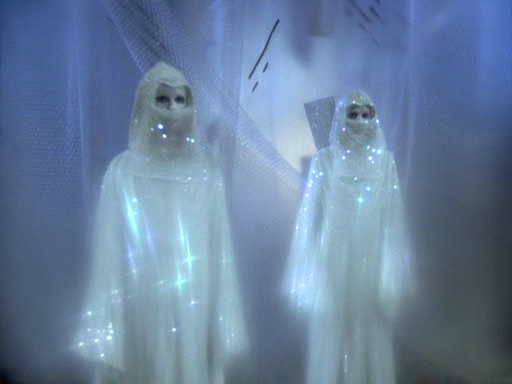 Star Trek has always been ambivalent toward religion, favoring science and reason. BSG, on the other hand, is steeped in religious symbolism and idealogy. This is especially evident in this episode, with the de facto star of Bethlehem guiding our little band of pilgrims across the galaxy. I'm curious to know whether the rebooted current series is in a similar, though undoubtedly more serious, vein, and I realize now that I'm going to have to watch it. You are forgetting, this series was created in the 1970s. What you call sexism was, mostly, just the way things were done at that time and are entirely reflective of the era. Feminism was still relatively new. You see its beginnings in the fact that the women demanded to become shuttle pilots, then were given vipers to fly when most of the men became ill. They are starting to come into their own. As for the Cylons being completely incompetent, it does make you wonder how they managed to form an empire and defeat the Colonies, doesn't it? - Apollo says to Boxey: "We're leaving our star system, Boxey. When we get through this asteroid dust field there'll be a whole new galaxy. One no human in this fleet has ever seen before." Okay, so which is it? Are they leaving their planetary system (which is the correct term, not star system) or their galaxy? Even Tigh throws around the terms loosely. As does Starbuck. 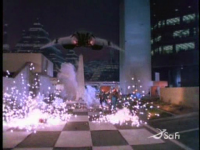 - The Galactica leaves the colonial home planetary system in this episode. - Starbuck regarding the ship he was left with: "It's like trying to fly a museum." 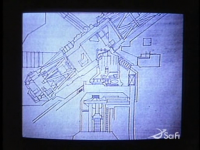 Back to its old ways, BSG 1978 produces an episode full of plot holes and technical problems. Once again, there's a habitable planet... er... well, asteroid found. And gee, it looked like a hunk of airless rock from space to me, but what do I know. Once again the show becomes the adventures of Starbuck or Apollo with the fleet taking a backseat. Once again, we get cookie cutter scenes aboard the Cylon Basestar. Baltar and Lucifer are getting so generic now that they could probably start recycling their plotting and scheming scenes in addition to viper dogfights. The biggest error though is what I've discussed in the problems section. The writers apparently didn't know the difference between a planetary system and a galaxy, and throwing the terms around so loosely makes the episode embarrassing to watch, among other details. I concede an extra point for the nice bits of humor in the episode, however. - If the weapon is indeed so powerful as to be capable of destroying the Galactica in a single volley, why not mount it on a Basestar and attack the Galactica directly? Maybe it depends on some sort of geothermal energy? This should have been explained. - Letting Boxey slip on board a military shuttle on the eve of a long range tactical mission seems careless by even BSG 1978's low military standards. - The hidden Cylon base picking off Vipers and the Cylon raiders ambushing the rest. - Colonial officer gives rank insignia to someone count 2. Apollo gives a military medallion that his father gave him as a graduation gift to Boxey. - There are multiple short clips in this episode of a Centurion staring at a very colorful alien computer display which is actually just a computer screensaver... I'm not sure why, but I find the idea of a Centurion staring at a screensaver vaguely hilarious. Hey look! A mysterious moon! (Later described as an "asteroid" on the computer screen, but whatever.) It's an obvious trap, but let's dive into it even though we have nothing to gain by investigating it! The military tactics here are at an all time low, as is the writers' understanding of three dimensional space. You simply can't "squeeze" a space ship into a single course so exact as to approach a specific planet, moon, asteroid, or whatever it is within range of a planet-based weapon. Overall, not too bad. And fortunately, Baltar's and Lucifer's single scene, while still pretty cliched, was far less so this time around. 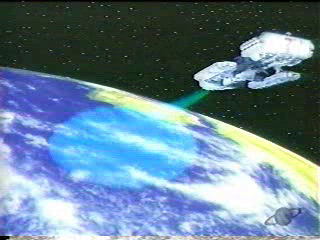 - All ships in the convoy increase to maximum speed, yet it still takes forever for the ships to get across. Either their maximum speed is painfully slow or that weapon had some crazy range. - Ships in the fleet destroyed: two, at least! - The Cylon Imperious Leader is named Barkol. - Apollo confronting the creator of the clones. - Thane suiciding the Centurions. - Seeing ships in the fleet destroyed! Part 2 wastes a lot of time. Having the clones and their creator added little to the story; the Viper dogfights got especially repetitive, mostly thanks to Baltar's erratic and poor strategy. The basic idea behind this story was to depict a mission to destroy a Cylon weapon so the RTF can escape the Cylons and live for another week. But we end up with lots of side stories. There's the clones and the cloner's responsibility for his work. There's Baltar and the Cylons internally conflicting, there's Starbuck trying to save his lost comrade (and his pursuit of clone women), there's the issue of the prisoners wanting their freedom, and of course the main plot. Most of these ideas are good ones, but without the right recipe, the souffle flops. - Ships in the fleet destroyed: two. 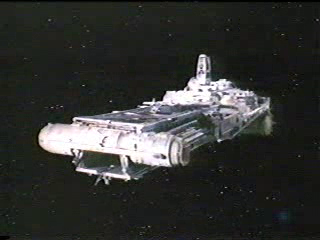 - The external shots of the agro ships were cool. 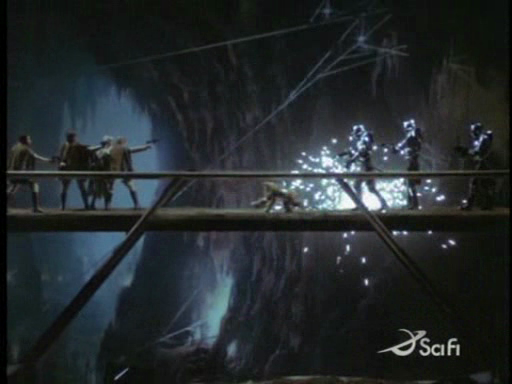 And BSG 1978 chalks up an episode full of cliche and silliness. I was really looking forward to this episode. I couldn't wait to see how the RTF solved its food shortage problem, but the serious survival issue became a silly romance with a touch of generic western sheriff nonsense. That, and... ANOTHER habitable planet. WTF? Who needs Earth when every planet in every planetary system seems to be habitable? In any case, I concede an extra point for giving us a chance to see Adama get more to do, showing us some neat shots of the argo ships, and the episode at least trying to tackle a real issue that the fleet is facing. Plus, as ridiculous as the episode is, it is somewhat cute if you try not to take it too seriously, despite the seriousness of the issue. - Starbuck: "Take it easy, will ya?" Centurion: "These humanoids are not well constructed. They damage easily." Starbuck: "At least we don't rust." Centurion: "Silence." - Watching Baltar play head games with the IL-series Cylons, while corny, was strangely amusing. - Colonial officer gives rank insignia to someone count 3. Starbuck gives rank insignia to Kyle. On yet another habitable planet, the adventures of Starbuck and/or Apollo continue. This week, Starbuck gets to lead an army of children against a Cylon-occupied castle. Meanwhile, the bad guys reinforce their incompetence by engaging in endless bickering, shortly before one of their occupied territories is overrun by a ridiculously small army of children. An extra point for making an (admittedly half-assed) attempt at doing character development on Baltar and his Cylon allies. - Cain supposedly perished with the 5th fleet two yahrens ago. - The colonials shooting at each other. - The first sight of the Battlestar Pegasus. - Cain and Adama arguing over whether or not to strike back against the Cylons and open a new offensive. - The attack on the Cylon tankers. 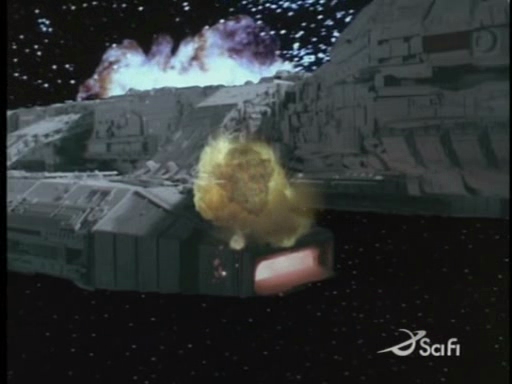 - Cain sabotaging the mission by destroying the Cylon tankers. - Adama relieving Cain and placing Tigh in command of the Pegasus. - The Cylon attack and ensuing battle. - The Pegasus joining the battle. 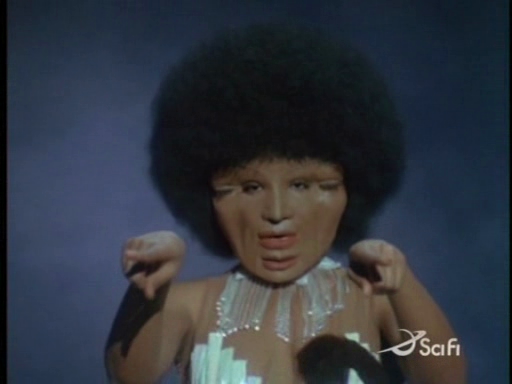 This is easily the best episode of BSG 1978. The implications of the survival of another Battlestar are milked for all they're worth here. Cain wants to go on a new offensive, but Adama wants to play it safe. This eventually leads to Cain turning insubordinate, forcing Adama to relieve him of his command. Throughout the episode, you want to side with Cain. Or at least I wanted to. 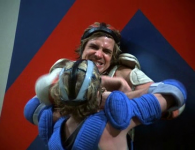 I wanted to see The Galactica and Pegasus conquer Gamoray and solve their supply problem. But just when you start to hate Adama for relieving Cain, three Cylon Basestars attack. Adama was right. Baltar finally gets some real action here. It seems his long term strategy was to wait for the RTF's resources to run dry so he could attack in full force. 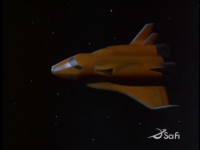 But just when Baltar's victory is so close that he can taste it, the Pegasus shows up in his fighter cockpit window leaving us with the best cliffhanger ever done on BSG 1978. - You've got to wonder how they were able to parachute into the city without their shuttle being shot down. 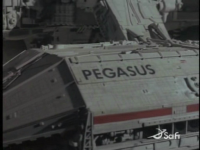 - When Pegasus fires her missile, the footage used is actually real life footage of the Command Module separation from the final extraction stage of NASA's Apollo moon missions. - The precision strike on the Cylon base. - The Cylon Imperious leader visiting the Cylon base. - Apollo: "Did you find the control center?" Boomer: "We found it all right." Sheba: "Where?" Starbuck: "There!" Explosion ensues. 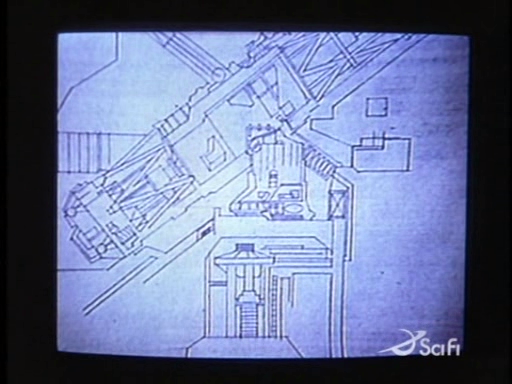 - Officer aboard Pegasus: "Sir, long range scanners picked up an unbelievable number of enemy craft on their way." WTF? An "unbelievable number of enemy craft?" How extremely unprofessional! - Apollo confronting Cain about his death wish. - Cain going on his suicide run. Part two, while strong compared to most BSG 1978 episodes, is weak compared to its predecessor. 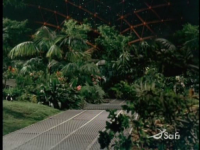 This episode revisits the BSG 1978 cliche in which a new habitable planet must be in each new episode and some dangerous mission must be performed there. Unfortunately here Cain is depicted as a foolish war monger, determined to strike back at the Cylons at all costs. Any number of better strategies could have been concocted for this episode to preserve both the Battlestars and make Cain a regular cast member. But sadly, in 1978, reset button syndrome affected a great many TV shows. At least we get to keep Sheba around. But I get the feeling there was pressure to eliminate the Pegasus from the story because the show is named Battlestar Galactica, not Battlestar Pegasus. A silly reason to hinder the story and a mistake repeated in many science fiction shows. Most notably, Star Trek Voyager repeated this mistake with the Equinox. As annoying as it is to lose the Pegasus, the episode was still a pretty decent ride, way above BSG 1978's average. And Cain's noble sacrifice was fitting, if overall a poor decision for the show in the long run. - When the bombs exploded, all the air was blown out of Boomer's compartment. How did that not kill everyone in the room? And yes, I know, they had oxygen masks. But quick physics lesson people... there's more to atmosphere than oxygen. The dramatic drop in pressure would have been equally fatal. - The Cylon Kamikaze attack. Many insults are thrown at this episode, but I tend to disagree. Yes, Fire in Space is shamelessly derivative. 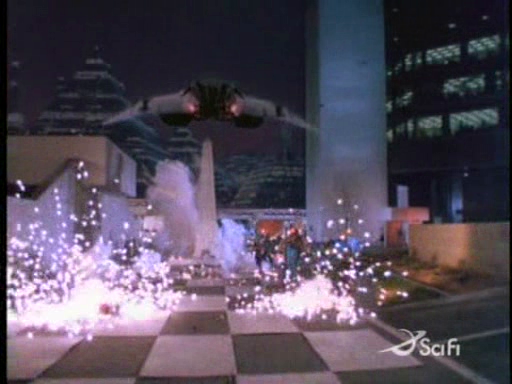 Yes, there are a few issues with the science in the episode. And yes, the military tactics are questionable once again. But really, these are problems fairly common to every episode of BSG 1978. So with that in mind I'd like to point out that the drama and tension level in this episode is unusually high quality. And the use of the characters was absolutely excellent. First, let's talk about the plot. It's not stated directly, but why do you think the Cylons are going on this suicide mission? Maybe it's because the Pegasus blew up their Basestars and have no place to land? Now that's what I call excellent continuity. Next, let's talk characters. A lot of neglected characters get important roles in this story, such as Tigh, Athena, Boomer, and Sheba. This breathes a lot of life into the plot, as you don't have to watch the same two or three characters for the entire hour. There wasn't much spectacle in the episode, no really great moments and no really memorable scenes. But overall the episode is far more watchable than most BSG 1978 episodes, and it'd be on my list of recommended episodes for people wanting to sample the best. The episode may be average at best, but it flows much better than the most of the others. I liked it. - Human life expectancy in this universe is about 200 yahrens. - Humans in this universe are just beginning to unlock the mind's true potential, with latent telepathic and telekinetic abilities. - Baltar confronting the council of 12 and Count Iblis. - Adama using telekinetic abilities. - Starbuck: "Sweet lady, there aren't many places I've been in my life where I didn't feel like I was in complete control, but, uh, this is an exception." - Alien to Starbuck: "Because as you are now, we once were. As we are now, you may become." - Apollo, Starbuck, and Sheba reciting the location of Earth: "Earth, quadrant alpha, nineteen million sectares by epsilon vector twenty-two, on a circular reckoning course of zero-zero-zero-point-nine... in a star system of nine planets and one sun." This episode is fascinating. We learn a lot about the nature of the Galactica universe here. For example, we learn that humans in this universe live longer than in the real world and they have latent telekinetic and telepathic abilities. We also learn that humans are on an evolutionary path in which they will begin to refine the power of the mind to the point of living to thousands of yahrens and having godlike powers. This episode implies that all it will take to accomplish this is for the human race to spread across the galaxy... to find Earth and bear new colonies elsewhere from it. 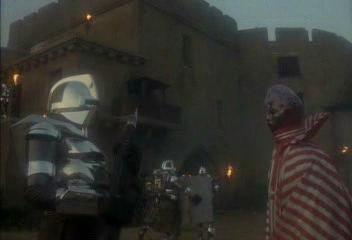 Even more interesting are the unfortunately vague implications of Count Iblis having some sort of connection to the Cylon leader. Is he / was he the Cylon Imperious Leader? Or more likely was he responsible for the destruction of the race that created the Cylons? Did he interfere with the Cylons from 1000 yahrens ago? Did he program the various Imperious Leaders? We're not given this answer, and it's really a shame too. Because it would give far more meaning to the whole story. Overall, a pretty good episode. But it would have been much better as a single episode instead of two, with more time spent showing us some more details about the various religious philosophy thrown around, the history of these beings, and less time spent on Iblis being evil. So what was in the space ship wreck? Points of for the cheesy "dream sequence" with the ancient aliens. Q beats Iblis in every way! Oh, and I am no big fan of psychic powers in sci-fi. - Starbuck, an orphan, has no idea how old he is. - Starbuck on "TV" talking about his history. - The revelation that Demitri really is Starbuck's father. An interesting look at civilian life in the fleet, and the Nomen were also a nice idea, but the episode seems to drag. We do get one nice tidbit in that this con artist really does turn out to be Starbuck's father, so the episode isn't a complete waste of time; I thought it was kind of nice that in the end Demitri decided it was best not to tell Starbuck the truth fearing Starbuck really will give up on the military to play catch up with the old man. I loved the Nomen - I hope we get to see more of them, and that we get some more nuances glimpses of their culture. The BSG response to TNG-era Klingons. Otherwise - mostly bottle episode, but with some new interesting settings - such as the passenger shuttle and the nightclub/casino. Too bad that Sheba got to play stupid again - I would love to see her take more command. - The evidence mounting against Starbuck. - Apollo proving Starbuck's innocence. Quite a bit of mud gets thrown at this episode, but I'm more forgiving. Murder on the Rising Star, while having nothing much at all to do with Galactica's preferred subject matter, is an interesting diversion. A "who did it" murder mystery that's decently executed. The beginning is especially captivating, with the fighting during the Triad game and the mounting evidence against Starbuck; I really believed he had killed him for a while. The ending, however, was fairly weak. While still just as fun to watch, I just simply cannot get over the sheer convenience of events, which leaves me with the impression that this episode wasn't at all thought through very well. I like! Great bottle show with good pacing and mystery. A lot of male bonding, of course, and the women are just decoration in the background though. But - what happened with Starbucks gun? How did Karibdis manage to kill Ortega with it? I love the panning shot of the Rising Star halfway into the shoe by the way. - One has to wonder why the Terrans and the Colonials are speaking the same language. - How is Cassiopea able to live on the sleeper ship at the end without... you know... being asleep with the rest? - According to Boomer, every human encountered up to this point were offshoots of the Colonials, or possibly offshoots of the 13th tribe that may have bailed during the journey and never made it to their destination. - According to Adama, "Terra" in Gemenese means "Earth." - Boomer discussing the significance of the finding of this ship. - The mysterious humans waking up. - Michael confronting the Colonials. Cheesy drama, but amusing in a juvenile way. Somehow, the main plot of this episode has more taste than other similar attempts. Particularly fun to watch is the Council of Twelve being outwitted by Adama. Though one could say that only barely makes up for the silliness which caused the situation in the first place. I find it hard to believe people could act so irrationally and stupid in the face of an unknown group of aliens. Another nice thing about this episode is we don't stumble on yet another habitable plant of the week. However, the treatment of these new "alien" humans that are not related to the Colonials in any way could have been done in a better way. There are technical problems and plot holes spread about their interactions with the Colonials; I get the feeling the author of this story wanted to rush through the whole first contact thing. Some other things which make this episode lose points are areas where it is decidedly lacking in taste. Specifically, what's the deal with Athena in this episode? Is she a viper pilot or a kindergarten teacher? The whole classroom scene reeked to me of overt sexism. It's as if they had nothing for her to do, so they conjured up something stereotypically feminine to pass some time. Also, what's the deal with the Eastern Alliance people being a bunch of space Nazis? Listen up American TV! Bad tradition! It didn't work on Star Trek, so don't do it on BSG! If less time was spent on silliness in this episode and more time spent on showing us what the realities of a first contact would really be like, it would have been worth more points. - How and where did the Nomen get their robes and weapons back? - Adama interrogating the Eastern Alliance officers. - One of the Nomen: "We do many things to survive. Even die." - Tigh's meeting with Apollo and Starbuck in the Officer's Club. - Starbuck: "Baltar, Nomen, and the enforcers. At least we've got all our enemies in the same place!" Apollo: "Including the council!" - The activation of the zombie Cylon. This episode brings up an interesting issue of whether or not Adama should be allowed to exert martial law over the fleet. Sadly the issue is not explored particularly well because the council is consistently depicted as completely incompetent. Even Adama's "overseer" appointed in this episode is somewhat dense, and the whole point of her character was to show that the council isn't a bunch of idiots! What I do like about this episode is its continuity. There is continuity with "War of the Gods" regarding Baltar's imprisonment. There is coninuity with "The Man with Nine Lives" regarding the Nomen. 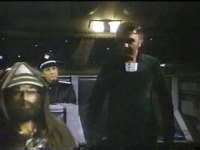 And there is continuity with "Greetings from Earth" regarding the Eastern Alliance captured soldiers and their ship. This episode serves to tie up loose threads from those episodes, or rather to compliment them. 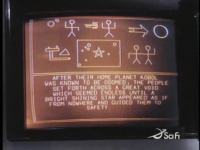 During a time when few science fiction shows understood the concept of episodic continuity or plot arcs, I do appreciate this attention to detail. But in the end, what could have been a fascinating look at government in the RTF degenerates into a silly hostage situation resulting in the ludicrously easy escape of the bad guys. As if the writers could not think of any good reason to keep them around, so it's time to get rid of them! Oh, the Nomen - I love them. An excellent bottle show with great continuity. Thumbs up. And a strongish female character for once - while Sheba continues to be a decoration Siress Tinia has more balls. Annoying though with the stupid slash incompetent council. And council security (police?) are just stupid and arrogant. - Starbuck and Apollo repeatedly say they're from another galaxy. - The missile footage is in fact recycled from various actual U.S. missile launches, some even including some of the Apollo Moon mission footage. - The ship of lights appearing. - John: "What an excellent idea." In response to Apollo's proposal that his entire conversation with him was a dream. - The Galactica taking out the nuclear missiles. So what is Terra? It is remarkably like Earth, but it is definitely not Earth, according to John. 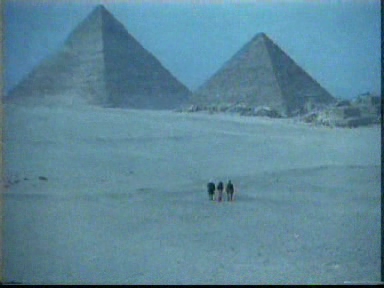 This episode would have been far more interesting if more time had been spent exploring the Terran civilization and showing the audience why it isn't really Earth. Instead, we're supposed to take John's word for it. Saving Terra from nuclear war was an interesting idea for a story, and involving the beings from "War of the Gods" was a clever and welcome continuity connection, but "Experiment in Terra" fails to measure up to its own profound intentions by not staying true to the prior material. Frankly, I have the same problem with this story that I had with "Lost Planet of the Gods." 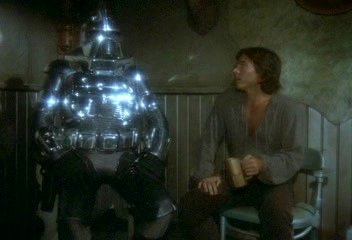 It leaves you feeling empty, when it should have been far more significant to the overall storyline of Galactica. I think part of the problem in this episode is that Apollo gets too much handholding from John. First it sounds like he has to figure out for himself how to help the Terrans. But through the episode mr John pops up every now and then and tells the boys what to do. And the Charlie Watts thread is kind of left hanging - if he is presenting himself as Apollo and tries to convince people that he is from the colonies, why being someone else then? - So, the Celestra loses its engines... and stops? Why can't intertia carry them? - Chronos held the flag of the 4th Colonial Fleet, aboard the Battlestar Rykon. - The ceremony at the beginning. - The revelation about the conditions on the Celestra. Bad science and poor timing ruins an otherwise viable episode. It makes little sense that by now, this mutiny hasn't already taken place. Furthermore, it makes no sense for a the fleet to be constantly exhausting fuel in order to maintain speed. An object in motion stays in motion unless acted upon by an external force. There's no external stopping force in space. Finally, how quickly a shuttle can be completely lost from the fleet hardly seems realistic. Conversely, the swift magical upgrades performed on the shuttle's sensors seemed equally unlikely. Sadly, the plot hinges on these weaknesses and the episode is hard to take seriously because of it. I kind of liked it, and Aurora was cute. I didn't have a big problem with the science - I can live with that - but I thought it was a bit unclear who was in on Chakra's plan. Also - how would he have gotten rid of Kronos if the group with Aurora and Damon would not have needed to be shuttled off? - The Galactica was launched over 500 yahrens ago, according to Apollo. - The opening star chamber scene. 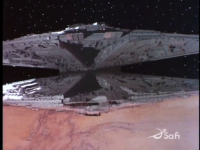 - The Cylon Basestar's appearance. - Adama declaring his intent to attack the Basestar. - Adama offering Baltar his freedom. - Sheba and Apollo finally getting together. - Boomer: "Whatever you do, don't lose that transmitter. It's the only way we'll be able to tell you from the Cylons." Starbuck: "Well if we do, we'll just waggle our wings." - Apollo regarding the Cylon fighter: "Know how to fly this thing?" Starbuck: "I thought you did!" - Galactica taking on the Basestar. - Galactica destroying the Basestar. - Starbuck waggling the Cylon fighter and Boomer catching it. - The final scene in the star chamber. So sad. However, unlike many, many prior BSG 1978 episodes, the technical problems do not bring down the plot. Very easily the Cylons could have been outwitted by some other plot device, or hell, even not at all. 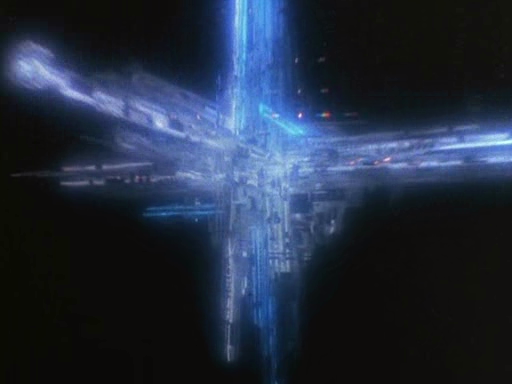 The Galactica barely makes any use whatsoever of their surprise attack on the Basestar anyway as the Cylons very quickly figure out what's going on and retaliate, making for a spectacular space battle. As an episode of BSG 1978, this episode shines. Elements of continuity from nearly all prior material is put into good use here, and the "let's stop running, turn around, and punch them in the nose" factor makes for an exciting change of pace. I grade the episode purely on these grounds, for as a finale to the series, this episode is less adequate. 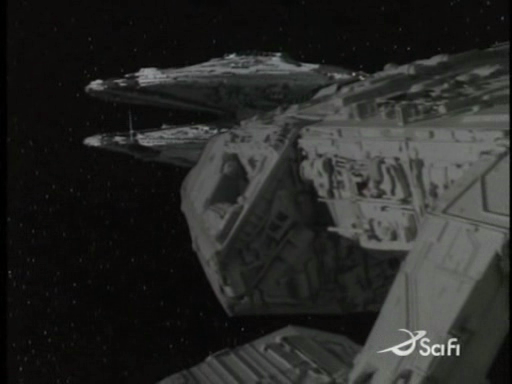 I am fairly sympathetic to the writers here for not taking Galactica directly to Earth in the season finale, as it's a far more complicated story than they had time to tell. Maybe the whole Terra storyline should have been abandoned and Galactica should have reached Earth instead of Terra, so the complexity of finding Earth could be explored in sufficient detail. But in the end, it's better to leave the show open ended than to totally conclude it poorly. A rushed "they found Earth!" episode at the end of the series would have been a bad thing. When Star Trek TOS was canceled, it ended similarly to this series. Just another episode. I find the lack of closure supremely annoying, but faced with the alternative of something rushed and worse, I must once again say, what we got was pretty damn good considering the circumstances. And so BSG 1978 goes out with a bang. This canceled series gives us one of its best outings, showing us just how good it could have become. A few more episodes like The Living Legend, Part 1, Saga of a Star World, Part 1, and this one, and a few less episodes like Greetings from Earth, Part 2, The Long Patrol, The Magnificent Warriors, The Young Lords, and Take the Celestra and BSG 1978 may well have lasted more than one season. I am a bit torn in my review of this episode - I give it an 8, for a lot of the points you brought up. I love the build up and the sense of real danger, Baltar works great (love that smirk as he enters the hangar). And the shots of Galactica in action with the base star. 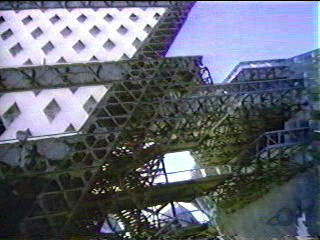 The camera work when Apollo and Starbuck are in the base star are great too - especially when they climb down that ladder. 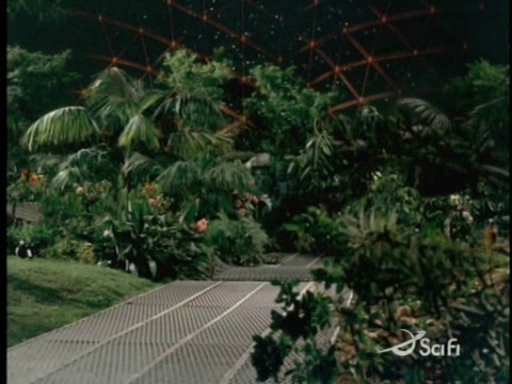 The scene in the beginning in the dome is great too - and nice what they did to Apollo + Sheba. But then - the episode also spent 2/3 of the time or so just talking and setting the stage. If you think back, not much actually happened in the episode. And them losing the identifier device was pretty obvious coming up.